I wish to upgrade from a Slingshot Dwarfcraft 5"4 board. I'll be adding some Lift carbon foils to replace the Hoverglide NF2 + school mast packages. (for sale in Sydney btw). Strangely there seems to be a lack of foil boards on the second hand market. I'm looking for something shorter and all round (no straps). Largest kite is a light-wind 12m kite so not too worried about floatation in light winds I guess. I don't have many comments to make on the Dwarfcraft as it's the only board I've ever had. Perfectly happy to get the new 4"6 Dwarfcraft unless anyone else can recommend an alternative ? You have a Slingshot Dwarfcraft 5'4"? I don't think they do a Dwarfcraft 5'4". Do you mean the Slingshot Converter 5'4"? I really like the Alien Air 4'8" as a general fun board, but if you want to go smaller, then perhaps the Slingshot Dwarfcraft 4'6". It's much narrower and has way less volume. Depends a lot on what you really need and what you like. The Slingy range of boards is pretty sweet. Yeah I do have a SS DC 5"4 - looks like it was a custom one. Happy to consider the Alien air and debate it's pros/cons vs the DC 4"6. I think it's the same as my Dwarfcraft 54 which is a 54 inch or 138 cm long board - not 5'4". They're Seppo's don't forget so still on imperial measurements. I still really like mine. Great strapless board. 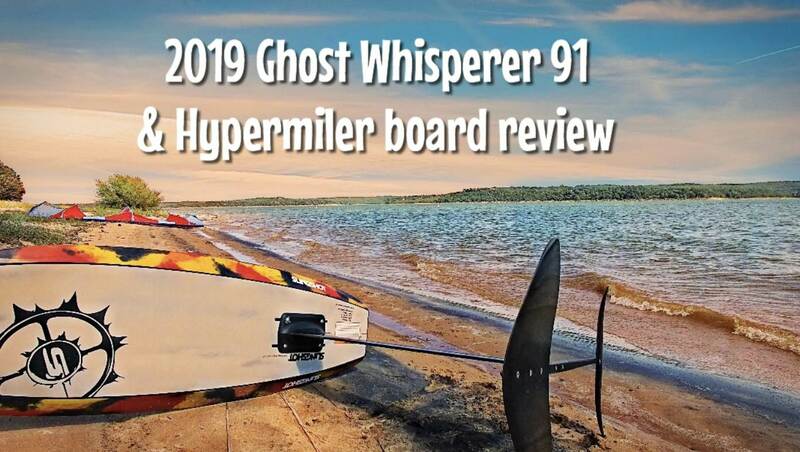 Does that mean the 2019 DW 4"6 is pretty much identical to my current board? The DC 4'6" is a nice board, one of my favs. The Alien Air is MASSIVE in comparison, takes the joy out of carving around because it's so wide and "massive" out the front. If you're getting a Lift, why not a Lift board? I thought they did bolt-through-board mounting, not rails? Yeah the alien air looks too fat for me. There's no local lift boards...and yeah no rails is a no deal. Axis does the Kink in about 3'6" or 100cm IIRC too. Just looks too small to me too, but I'll give it a shot if there's one handy. I've got the Ride 48, but I'm noticing I clip the wide part of the nose a lot, and wonder what a race board with straight rails would be like... I've only ridden the DC when I was powered, so I'm wondering how it'd feel in very light wind. Horacio makes a 42" (106.7cm) and smaller ones too. 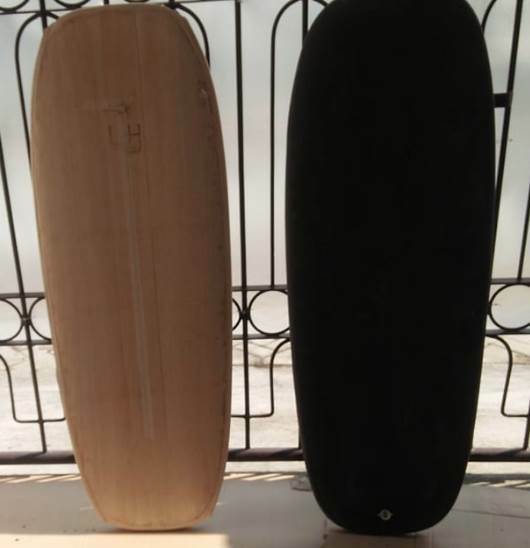 There are two SS DC models in the 3'6" standard and the micro (thinner less volume). J Shapes do a small pocket board also. Yes the 2019 DC is the same except for a raised tail deck pad for the back foot. Why change the 54" is a great all-rounder? Alpine foil have the fs2 pocket board, and a new convertible VR3 surf board with the 4 bolt rail mount. Has George W Bush started a kiting business?? BTW, it's pronounced HyperMILEr - as in the measurement of distance - not Miller as in the beer. I run two boards.... the naish hover 155 for super light wind days (8 knots). The fatness and flatness helps get my lard arse up and planing. And a Naish Hover 130.... small, no swing weight. But only for experienced foilers, not a good first/ learner board imho! 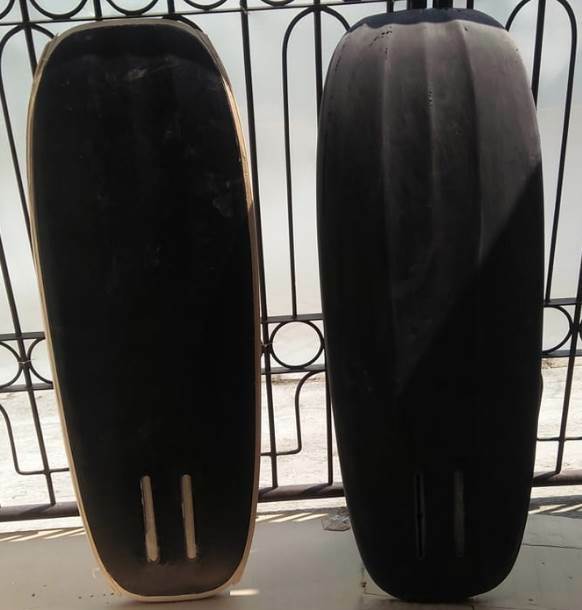 Second pic is a cross section at the red line, this shows the begining of a slight deck concave which will give a nice comfortable skateboard like feel.